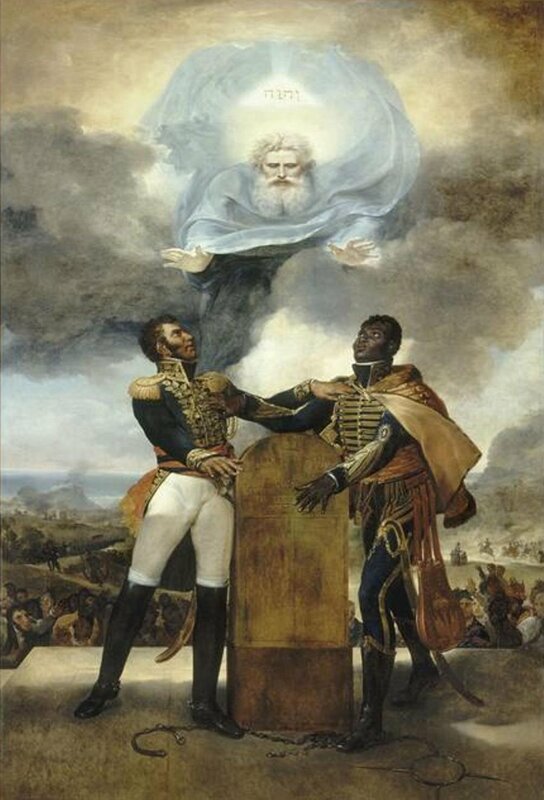 To honor the successful Haitian Revolution of 1791-1803, the influential French painter Guillaume Guillon-Lethière, “né à Guadeloupe” painted the controversial piece Oath of the Ancestors or Serment des Ancêtres (1822). The painting celebrates the union of Black and Mixed-race slaves against Napoleon’s army by staging upfront the Haitian Independence heroes Jean-Jacques Dessalines and Alexandre Pétion. Oath of the Ancestors not only eternalizes the collaboration that has defeated the imperialists’ strategy to “divide and conquer” but it also symbolizes the complicated relationship between an emancipated people and its former authority figure, by showing in prominence a White figure acknowledging the sacred moment. As a mixed child of a White colonist and Black slave from Guadeloupe, Guillaume Lethière also finds himself in the historical context of his painting. From the way the Oath of Our Ancestors was smuggled out of France into Haïti’s Catholic cathedral in 1822, to its present restoration in France after it was buried under the Haitian Presidential Palace during the earthquake of January 12, 2010, Lethiere’s piece captures a meaningful moment in history, which remains relevant to many aspects of our evolving world of freedom. During the fall semester of 2011, in a class entitled “Modern Exhibition Culture” taught by Professor Daniel Harkett, my term paper studied the exhibition history of the Oath of Our Ancestors and analyzed its relevance to Haiti’s contemporary notion of freedom via the painting’s journey through time and place. It also began to explore the exhibition setting that would best apply for people to view this piece of art, post-restoration. The preservation of culture and history is important in Haiti because its valuable art pieces and old structures have been damaged during the earthquake of 2010. However, in November 2011, the Louvre museum in France exhibited the restored Oath of the Ancestors in its galleries, and in doing so dismissed long-term plans of collaboration between the French and Haitian government in the restoration of the painting. With the lack of information provided on recent decisions regarding the painting, the Haitian people, like their ancestors Jean-Jacques Dessalines and Alexandre Pétion are rendered vulnerable, under the gaze of their oppressors. History seems to repeat itself through the exhibition of the Oath of the Ancestors. In this study, I will continue to research the history of of The Oath of the Ancestors, while developing further a proposal for exhibiting the restored and repatriated work in the city of Jacmel, Haiti. This proposal will complement my final thesis in the architecture department, which is focused on spatial narratives and architectural preservation of the Manoir Alexandra and Civic Center of the Historic District of Jacmel. In the final document I will produce for the ISP, I will include visuals of my architectural explorations, and a plan for a museum catalogue for the exhibition of the Oath of the Ancestors in the Manoir Alexandra in Jacmel, a house with a history of social complexity that coincides with the exhibition culture of Le Serment des Ancêtres. If you have any question or feedback, please feel free to contact me at: jolivertnathalie@gmail.com.